On March 29 Ready Player One will be released as a motion picture. In a way I was looking forward to it and in preparation I wanted to reread the Ernest Cline novel. I still loved it, just not as much. 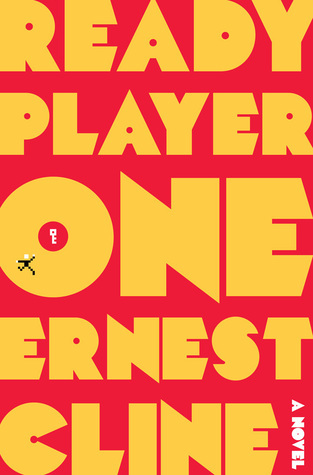 I give Ready Player One by Ernest Cline four out of five hearts because I loved it but a little bit random. First I have to let you know I am someone who was born in the tail end of the 1980’s and so all through out my youth I have seen and heard about the Commondore/Atari etc computers. So for me this novel is one big feast of recognition while reading a fast paced story. Overall the idea behind the story is great. A world where everyone has retreated into a virtual world (current parents worst nightmare) and the main designer sets up an easter egg hunt to see who gets to be the next owner. All the characters are well developed and now that I read it a second time I can see the little hint behind some of the details that are only be uncovered in the end when the main characters meet up in real life for the first time. Ernest really knows how to pull the reader in and keep them engaged. His writing is witty and funny. The only bad thing about this novel is that sometimes there is too much information and even though Wade is an unlikely hero, but he does get a lot just handed to him or there were just things Ernest didn’t explain to well. I think if you can see through these small things, Ready Player One is a really great read. Tomorrow Ready Player One will be released in the cinema’s. I have been looking forward to seeing it for a really long time. But I am also very hesitant. I am pretty good at judging a book-to-movie adaptation as movie by itself instead of judging it on who much of the book they used. But I have already seen things I feel take away from a lot of the things that are going to bug me when they stick too much to the book. Tye Sheridan plays Wade, Olivia Cooke is Art3mis and Simon Pegg as Ogden Morrow seem like a great cast of characters. So I am going to see it, but I don’t know when yet. I will see. Let me know what you thought of this book and/or the movie! This entry was posted in Book Review and tagged Adventure, Book Review, Drama, Dystopia, Ernest Cline, Fantasy, Mystery, Romance, Science-Fiction. Bookmark the permalink.